A suite of three linked one act plays. A thread runs through them, in that the first, ‘Encounters’ is set in a coffee shop; the second, ‘Nighthawks’ is set in a New York diner and is based on the subject depicted in a painting. The third, ‘The Art of Criticism’ is also themed around a painting. 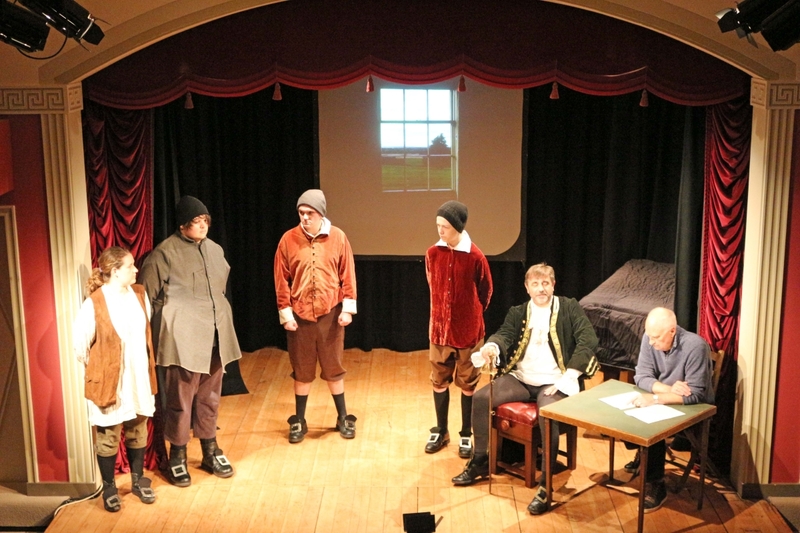 A short melodrama, 'Colonel Lisle's Decision' concerns a fictional incident in the English Civil War. 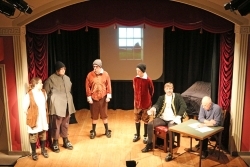 ‘Encounters’ was awarded third prize in the Oxfordshire Drama Network one act play competition, 2012. ‘Encounters’ is set in a coffee shop and takes the audience through a sequence of six linked scenarios, overhearing the conversations between the customers as they come and go with Alex, the waitress, providing the focus. Some of the scenarios are serious or confrontational, some humorous, each with their own payoff and all leading to an unexpected conclusion. The time is the present, so that the language and references are of today. The audience is presented with a chance meeting between a separated couple; a desperate salesperson’s conversation with his/her client, with apt comments from another customer; a university lecturer’s dilemma and the possible solution; the problems created by an expensive impulse purchase; a man asking for directions and getting some he didn’t want and finally some unwanted sibling rivalry. The running time is approximately 45 minutes and requires a simple set which can be embroidered if time allows. ‘Nighthawks’ takes Edward Hopper’s well-known painting of the same name as its starting point, setting out to provide the backstory of the characters depicted in the painting and their air of loneliness and isolation. The play is set in 1941, with some of the action set prior to the attack on Pearl Harbor and some in the aftermath. What has happened to the characters to leave them looking as they do? The audience is presented with a possible reason and are left to draw his or hers own conclusion. As far as possible the action and dialogue is true to the period, as are the facts on which the dialogue is based. Please note: there are two versions the play as the latter part of the play can be seen from the different perspectives of the characters. Directors can choose whichever version they consider to be most effective. Cast: 5M and 2F. Running time approximately 45 minutes; a relatively simple set which can be based on that used in ‘Encounters’. ‘The Art of Criticism’ revolves around an art critic and a visitor to a gallery and their different interpretations of a famous painting, in this case a Mark Rothko abstract. The critic’s rather pompous take on the meaning of the painting is challenged by that of the down-to-earth visitor; one man’s interpretation is as good as another’s. 2M (or 1M and 1F if desired.) Running time approximately 10 minutes. A short melodrama, being a fictional incident in the English Civil War. Setting: The date is April 30th 1645, the day after Cromwell's failed assault on Faringdon House. The scene is a small room in the house, which has been cleared for action and contains nothing but a cloth covered desk and two chairs. Cornet Shawe is seated at the table with papers, quill and ink; Colonel Lisle is looking out of the only window, hands behind his back. Cast: (6M and 1F) Colonel Lisle, the Royalist garrison commander. Cornet Shawe, his aide. Ensign Grey, acting for the defence. Thomas Wade, once an agricultural labourer, now a trooper. Susanna Haddon, once a maid, now a Poseman. (See note below.) Ralph Cardwell, a trooper and Thomas Wade's rival. Captain Canon, a Parliamentary prisoner. Notes: Although this incident is a fiction there are also some facts contained within it; Colonel Lisle was the Garrison Commandant at the time of Cromwell's attack on Faringdon House, and Captain Canon was a prisoner. Illicit relations between the men and women constituting the garrison was an offence punishable by hanging. According to the muster roll over half of the defenders during the siege of Faringdon were women and most of these were what was known as 'Posemen'. These were women dressed as men who were used as snipers, equipped as they were with long barrelled, small bore muskets, which were accurate over greater distances than the usual muskets.